How many times has old Earth been inhabited by sentient beings? How many great civilizations have come and gone? How many extinction level events have happened to these great civilizations? This science fiction story is about one of those great civilizations 65 million years ago. This spellbinding coming of age tale is about Arius of Atlantius, who chronicles the events leading to the disaster. Can Arius Prove His Father Wrong? 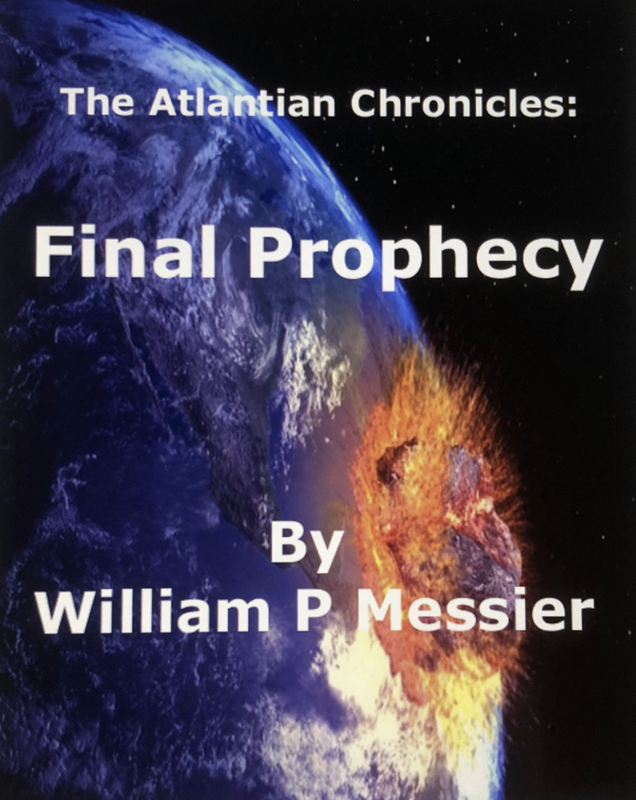 Atlantian Chronicles: Final Prophecy is an exciting science fiction story about a great civilization inhabiting Earth 65 million years ago. This spellbinding coming of age tale is about Arius of Atlantius, who chronicles the events of his disastrous last two weeks from the unsettled safety of his wrecked light-ship. Since birth Arius has been confused about his role as the future ruler of Atlantis. He soon discovers that an impossible task bestowed upon him and his friends by his father will test his resolve and trigger his ancestral DNA. Can Arius complete the four truths of knowledge? Can he stop the extinction of his world? Don’t miss the answers to this chronicle from master storyteller William P. Messier. Dr. Messier spends a good deal of time drawing connections between Arius, his friends and his natural environment: the whales, flowers, Pterosaurs or flying birds and stars are all his brothers or friends. At the beginning of the story he has the heart of a little boy, eats wafers for strength, longs to be independent, etc. Also, apparently contradictory elements are repeatedly shown as aspects of one unified whole: the jungle is both kind and cruel, feminine and masculine; the sentient guardian is beautiful but deadly; the meat-eating dinosaur is noble but cruel. The novella's premise of unity helps succor Arius in the midst of his great tragedy. For Arius, success and failure are two equal facets of the same existence. They are transitory forms which capriciously arrive and depart without affecting the underlying unity between himself, his friends and nature. At the end of the story Arius has the heart of a man. As long as he focuses on this unity and sees himself as part of his friends and nature rather than as an external antagonist competing with it, he cannot be defeated by whatever misfortunes befall him. Can Arius complete the four truths of knowledge?